The Saba Nut is an ideal sub-tropical food tree that is drought, disease and flood tolerant. It has been renamed by the UN as the Provision Tree because of its importance to developing nations - it is able to grow in harsh conditions and provide sustenance from the nuts produced, as well as the new leaves which are eaten fresh and used in stir fry. It is a medium sized fast growing evergreen tree which is grown in many parts of the world. It is grown mainly for its edible nuts; however it also makes a suitable potted indoor plant or outdoor specimen. The large white flowers are very fragrant, another reason to have it in the garden. It is a stunning looking tree (related to the boabob) with a distinctive swollen base trunk, and is a beautiful landscape tree or feature tree. The leaves are large, divided and bright green. The flowers are very ornamental, 10 cm long, cream 'shaving brush' style flowers. Production starts within a few years. The large, white, self-fertile flowers display spectacular clusters of 10cm cream-white stamens. The fruit is a woody green five-valved pod up to 30cm in length. Harvesting is so easy! The capsules that follow burst open when the nuts are ripe and you don't need to prepare them any further. The seedpods containing the nuts change colour from green to brown when ripe, usually toward the end of summer. The seeds can be eaten either raw or roasted. When roasted or fried in oil they taste like a cross between macadamias and chestnuts, raw the taste is more subtle. They keep for months in a cool, dry place. They can also be ground and used as a flour substitute when baking bread. This tree could seriously challenge the macadamia, the nuts are so good. 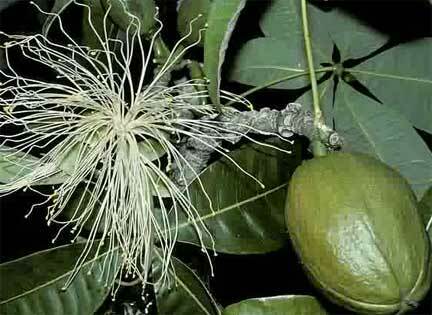 The scientific names aren't quite settled, and it may be known as Pachira insignis or P. aquatica, but all varieties are similar. Also known as the Malabar Chestnut, and also commonly sold as a 'lucky' house plant under the name 'money tree'. Saba nut grows well in mild inland parts and coastal areas. It will tolerate brief exposure to low temperatures, but protect from frost. It will be happy in full sun to part shade. Plant in well drained soil with plenty of mulch (keep it away from the trunk).